Serena Williams became one of the most accomplished American athletes of all time after winning her fourth consecutive Grand Slam title on Saturday at Wimbledon, according to The Atlantic. The high-performing athlete, who has long been applauded and respected for her longevity in the game of tennis, became the oldest female Â tennis player to ever win the title. Williams, 33, defeated Garbine Muguruza 6-4 to 6-4 to win her sixth Wimbledon title, concluding her 28th consecutive victory in a Grand Slam match. 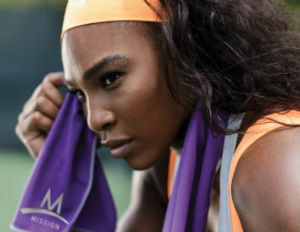 As a teenage tennis prodigy, she followed her older sister Venus Williams, from Compton, California, to the stage of the U.S. Open. In 1999, the 17-year-old Williams won her first Grand Slam title, defeating Martina Hingis and shining light on what would be an illustrious career. Let’s take a look at four of her most notable moments on the court, as noted by Matt Schiavenza of The Atlantic. 1. The 16-year gap between Serena’s 1999 U.S. Open win and Saturday’s Wimbledon championship is the largest in women’s tennis history. Muguruza, her Spanish opponent on Saturday, was five years old when Serena won her first Grand Slam title. 2. Serena’s 21 Grand Slam victories are now the second largest number of wins since the Open Era began in 1968. Only Steffi Graf, the great German player who won 22 Slams in the 1980s and 1990s, has more. With four more titles, Serena would pass Margaret Smith Court with the most Grand Slam championships of all time, Open Era or not. 4. At 33 years, Serena became the oldest women’s tennis player to ever win a Grand Slam title, eclipsing Martina Navratilova, who won Wimbledon in 1990 when she was a month younger than Williams is now.